Although we had a heatwave a few weeks ago, the chilly air is back in the Pacific Northwest, especially when the clouds float in. They feel like a warm cocoon, and I welcome their presence. We need the rain, I hear it’s on the way, as its been sparse this Spring. Predictions forecast a warmer summer. Thinking there may be a tiny, infinitesimal chance the heatwave turbocharged the ripening of strawberries and maybe local asparagus, I took a drive out to one of the farms yesterday, not because I’m anxious to get my hands on fresh strawberries and the freshest asparagus or anything. Turn oven up to 425F (218C). Line two sheet pans with parchment paper. Place the mushrooms, bell peppers, asparagus, tomatoes, garlic and shallot on one pan. Sprinkle with 2 Tbs of olive oil. Using a spatula, mix all the veggies together with the olive oil. Sprinkle with salt and pepper then stir again. Move 1/2 the veggie mixture to the other sheet pan. Spread the veggies in one layer, making sure there's no overlapping on both pans. Roast in 425F oven for 35-40 minutes (due to oven variations, keep an eye on your veggies and start checking your veggies at 25 minutes; a bit of charring is good! ** SEE NOTES!!). Rotate pans 1/2 way through roasting. In a large saute pan, heat 1 Tbs of Olive Oil on medium heat until shimmering. Add the orzo and stir, coating the orzo throughly. Stir occasionally for about 3 minutes or until the orzo is toasty and golden. Add the vegetable broth. Be careful here because the broth will spit and sputter. Bring to a simmer, turn down the heat to low, cover and cook for about 15 minutes or until all the liquid is absorbed. Stir. Remove from heat, cover and set aside. In a small bowl add the olive oil, lemon juice, salt and pepper. Whisk until all the ingredients are emulsified. 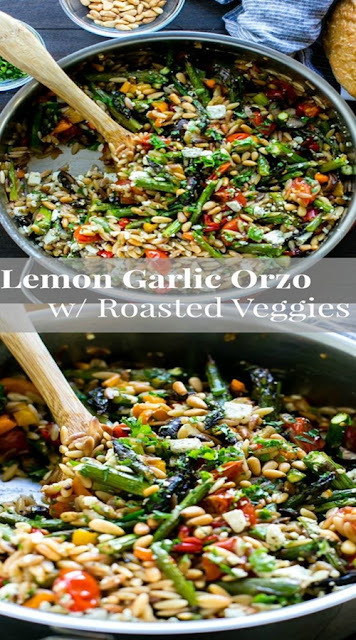 In the large saute pan, to the orzo, add the roasted veggies and all their juices, stir in the dressing, feta, and pine nuts. Garnish generously with basil and parsley. Serve immediately.